For radio listeners, there are hardly many best buys as beckoning as the Insignia NS-HD01. 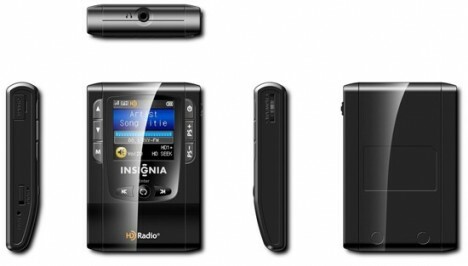 A radio tuner with the size of an iPod, the Insignia NS-HD01 comes with a color LCD, a 3.5 mm headphone jack, and a rechargeable Lithium-ion battery. The radio also comes complete with a Velcro armband in the box. There are ten preset memory channels for users to tune in to their favorite channels. Users can tune in to both analog and Hybrid Digital (HD) stations on the FM range. Access to the HD radio is free, unlike satellite radio which comes with a subscription fee. Users can easily slip the radio into a pocket while they go jogging and even toggle on the HD2 and HD3 sub channels. Radio fans would be spoilt for choice and the sound quality ranges from decent to superb. For the price tag of $50, the Insignia NS-HD01 is a great bargain.